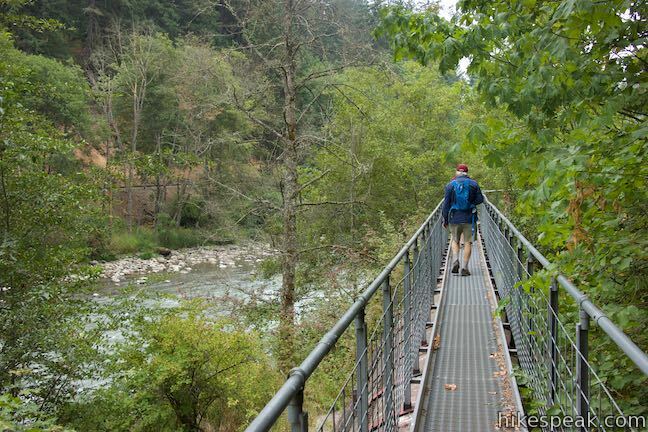 Most of the trails in Columbia River Gorge lead to big waterfalls or big views, but one of these trails is not like the others. 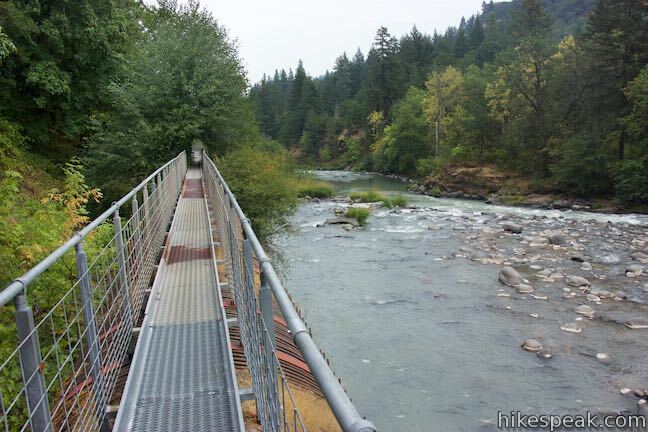 The Pipeline Trail near downtown Hood River has a hiking experience that could very well be a one-of-a-kind. 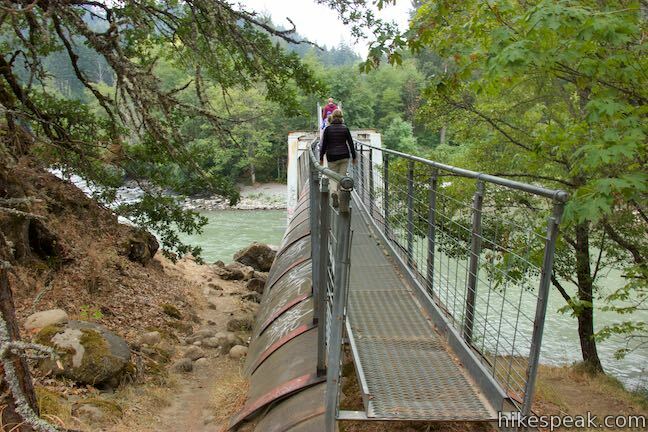 This route exchanges the average dirt trail for a catwalk built on top of a penstock pipeline. 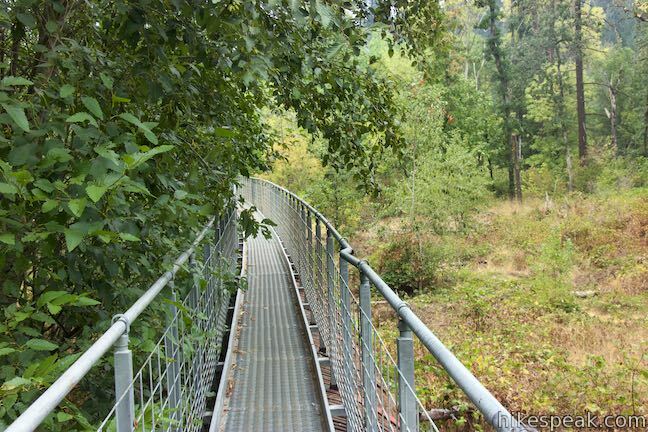 That catwalk stands a dozen feet off the ground and whisks visitors through tree branches to raised views of Hood River. 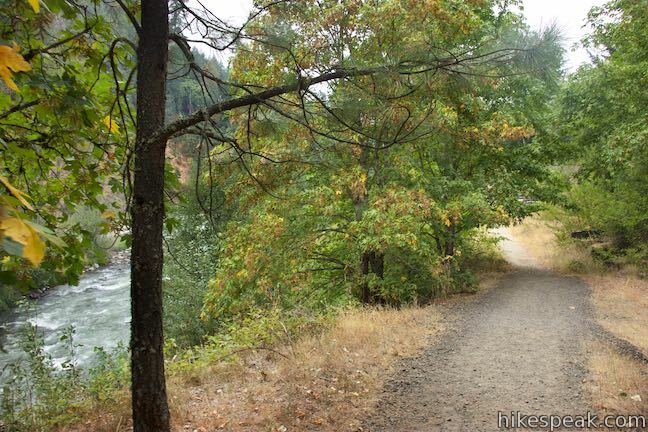 The distinct hike on Hood River Pipeline Trail is easy too, at 2.8 miles round trip with just 100 feet of elevation change. 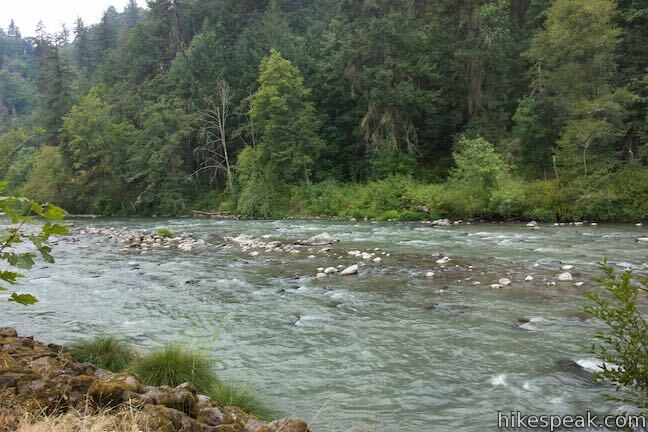 Hood River flows some 25 miles from the slopes of Mount Hood to the shores of the Columbia River. 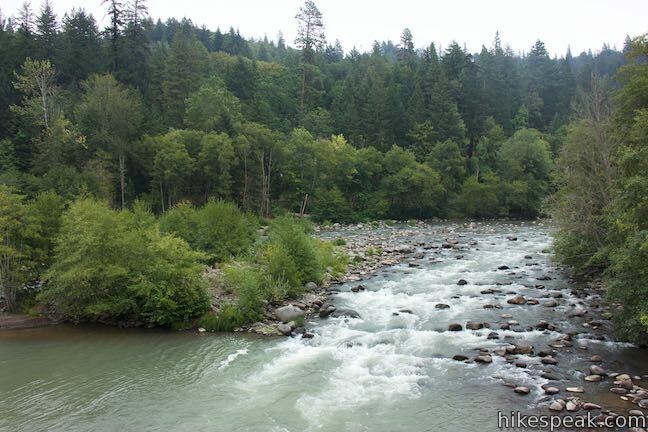 Along the way, the water nourishes Hood River Valley and creates a scenic alley for this unique hike. 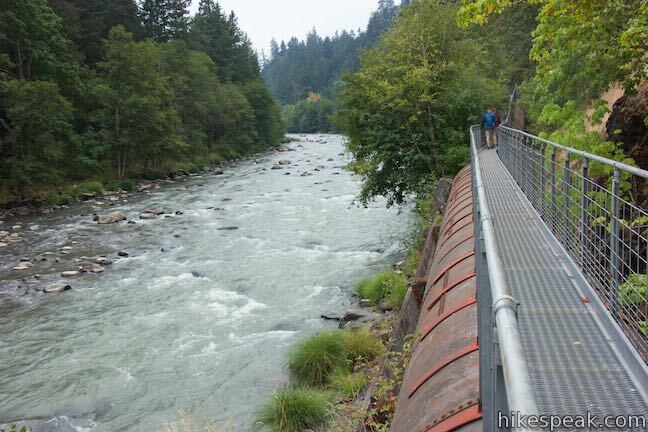 For much of the 20th century, Powerdale Dam regulated the flow of the river and delivered water, via a long pipeline, to the Powerdale Substation, where hydroelectric energy was produced for the city of Hood River. 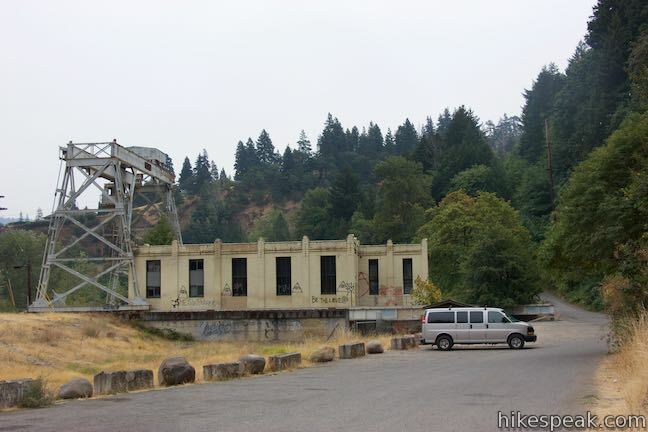 More recently, the dam and powerhouse were decommissioned. About half a mile of the pipe was removed to restore the area, and flooding wiped out other stretches of the pipeline. 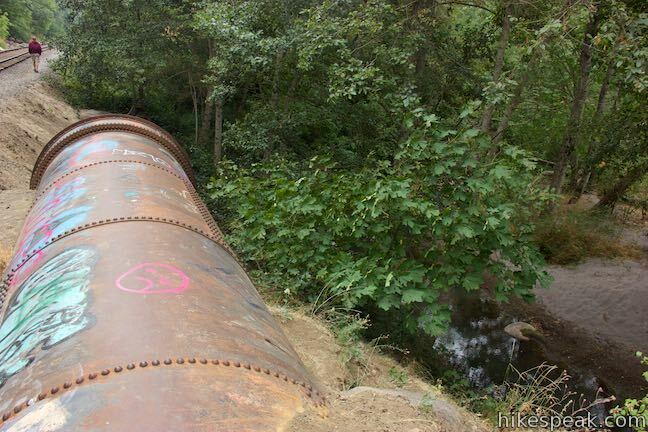 Fortunately, about 2/3 of a mile of the pipeline remain in place, including a bridge across Hood River. 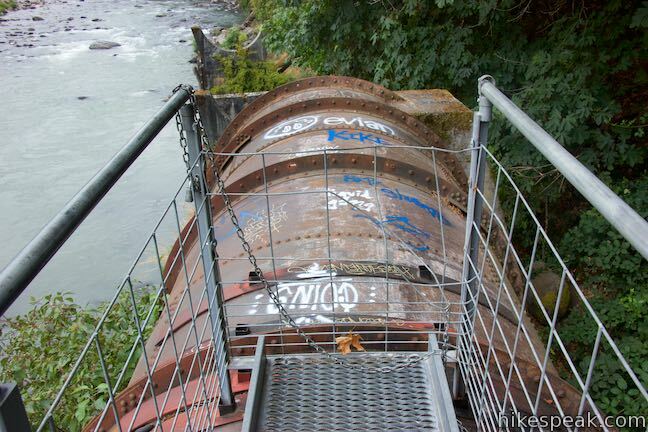 Also intact is a catwalk going across the top of the pipeline, previously used to service the flowline for the substation, but now maintained just for public enjoyment. 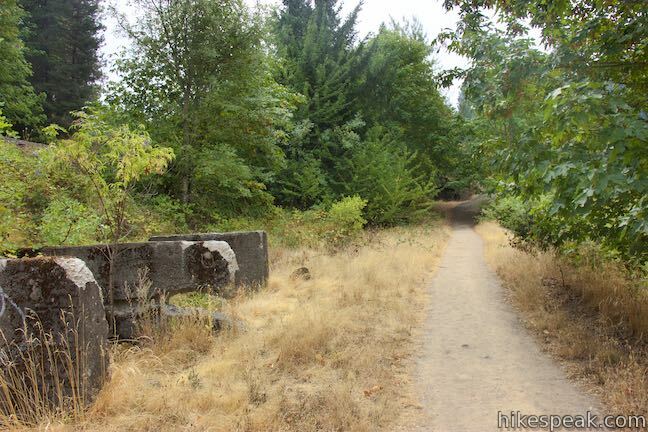 Half a mile from Interstate 84, find a short, old road dropping from Highway 35 to a trailhead parking area beside the now defunct Powerdale Substation. 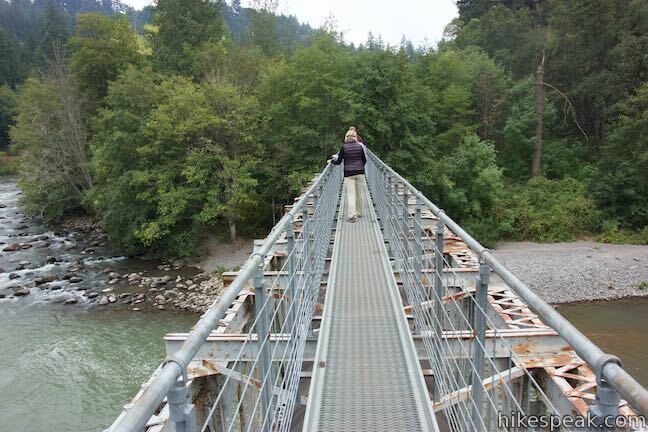 Overlook the paths wandering north toward a trestle bridge across the Hood River and begin on the established trail. Go around the gate and hike southwest. 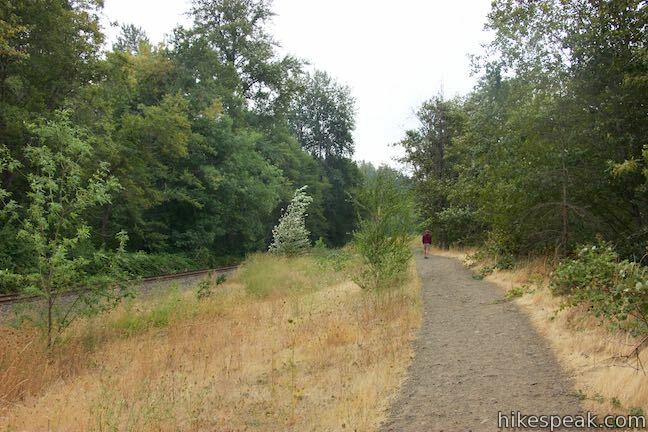 The wide and level dirt trail passes alongside a clearing below a wooded slope. 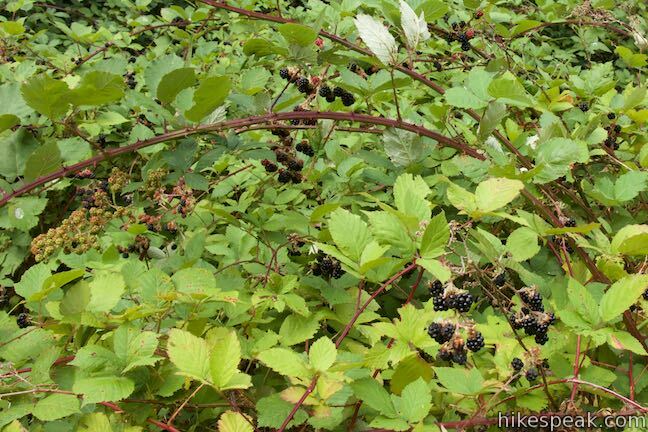 Poison oak hides below blackberry brambles on the left. 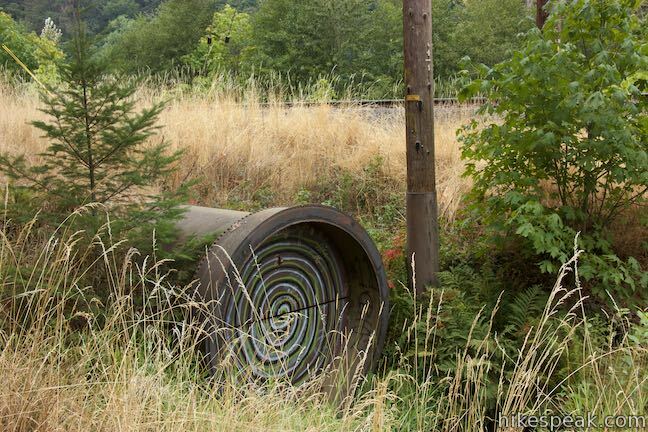 Spot the sealed end of a steel pipeline, which disappears into the ground as you go up a short slope alongside the pipe. 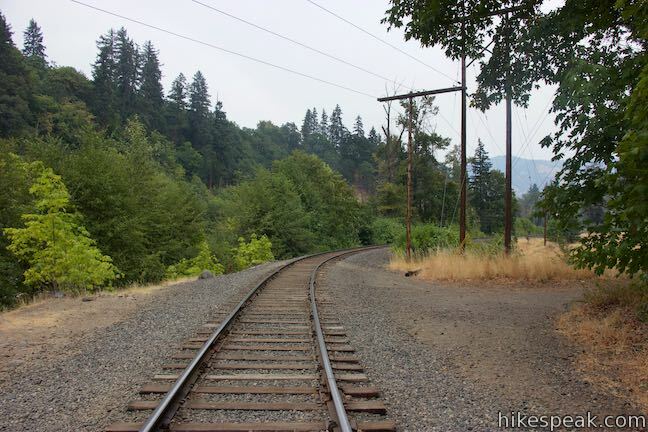 Cross a line of railroad tracks and bear left, bordering another section of pipeline between the tracks and the river. 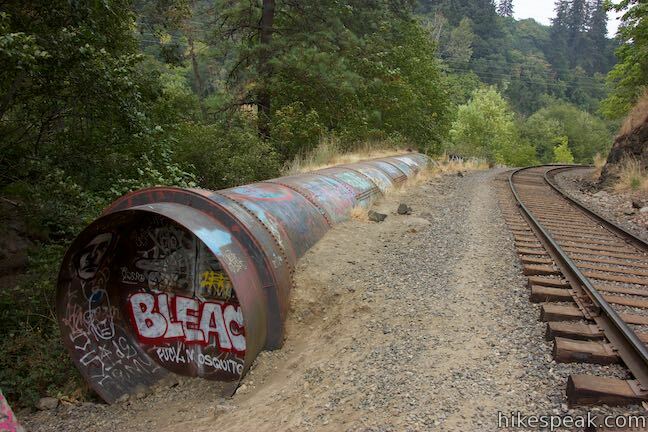 You can even walk on top of this pipeline if you like, to get a taste of things to come. 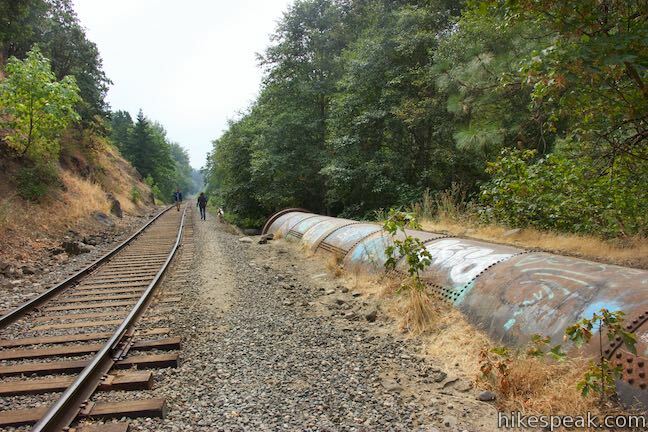 (While surrounding pipeline was removed, this stretch was probably left in place to avoid disturbing the rail line). 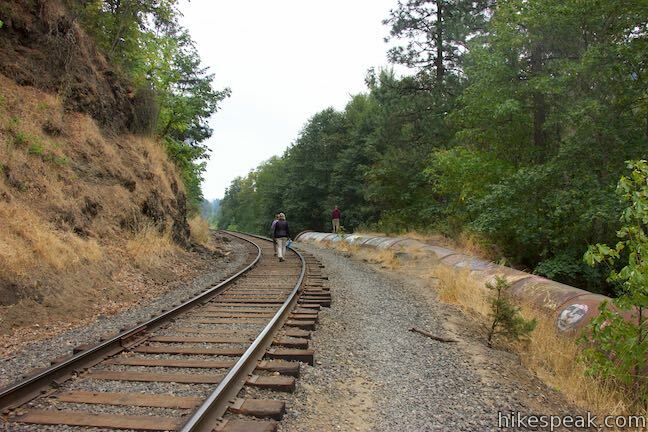 Walk up a path along the west side of the train tracks. 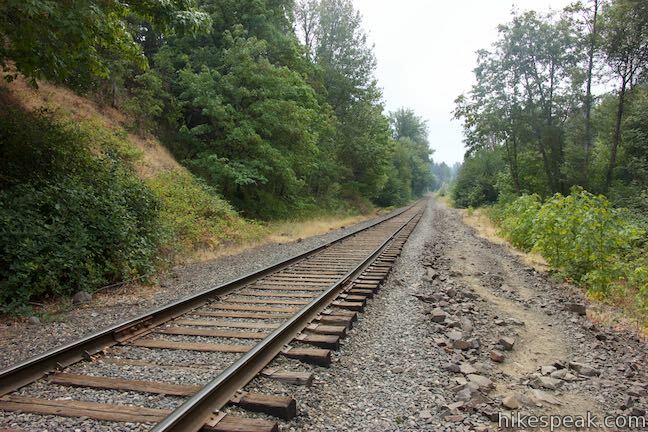 After 0.15 miles along the tracks, and about 1/3 of a mile from the start, follow the trail as it bears right through some short brush, parting from the railroad tracks. 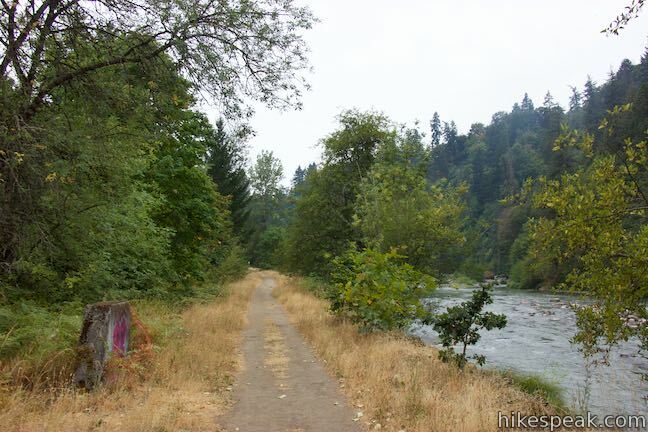 Although the trail remains parallel to the rail line, it gets closer to the river and the scenery improves. Look across Hood River. 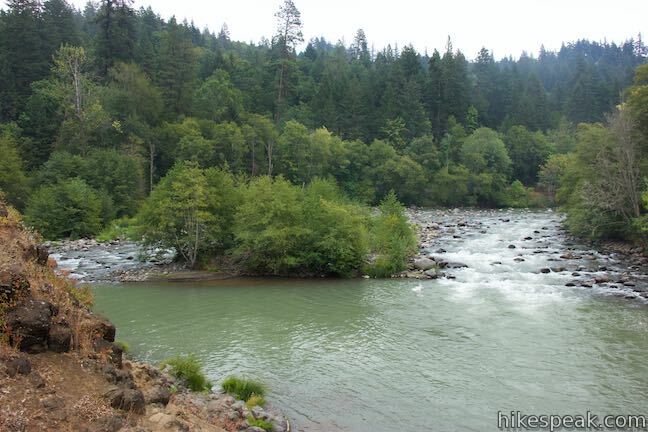 The tumbling water is backed by trees rising up a steep bank toward Hood River homes. 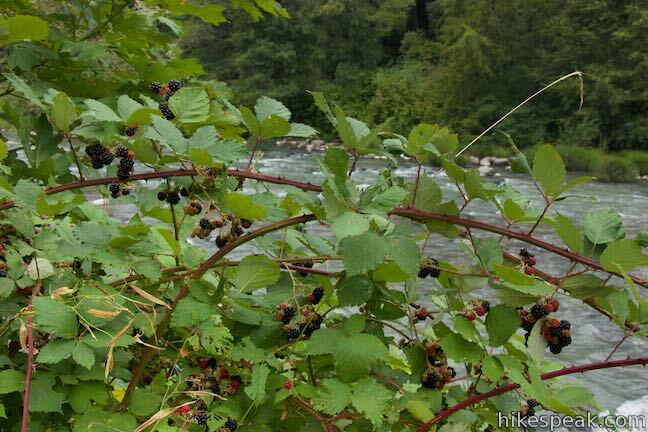 Between the river-lining alders, find patches of blackberries that ripen in August (boasting delicious jammy flavors). 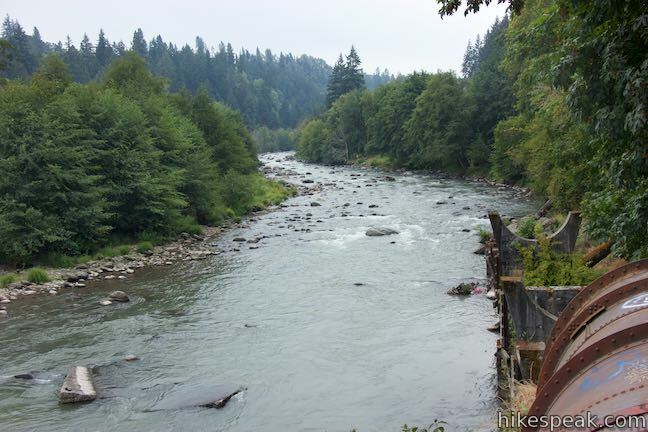 The leisurely walk along the river traces the old route of the pipeline. Pass some concrete supports that remain after the pipeline was removed. Eventually, the trail goes up a short slope and comes to a junction. 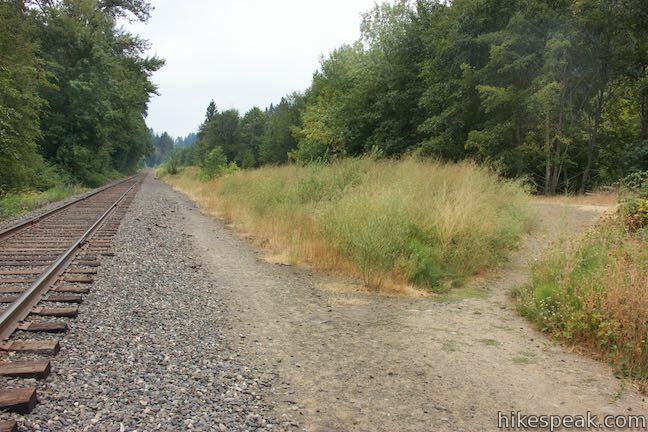 Avoid the trail on the left that heads across the railroad tracks. Do the obvious thing by staying to the right along the trail. 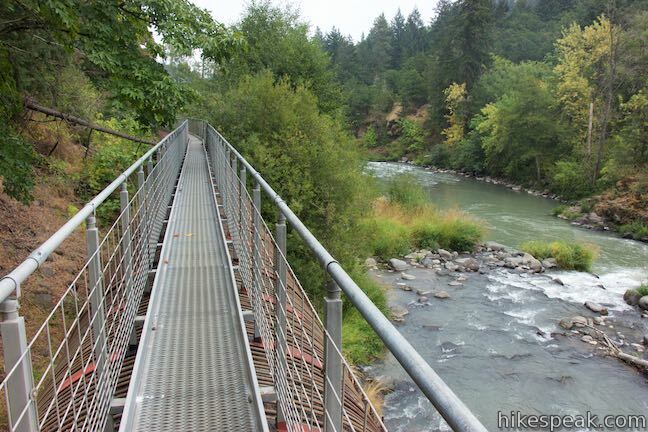 In less than a hundred yards, come to a bridge where the catwalk adventure begins. The pipeline reveals itself, coming out from underneath the trail. 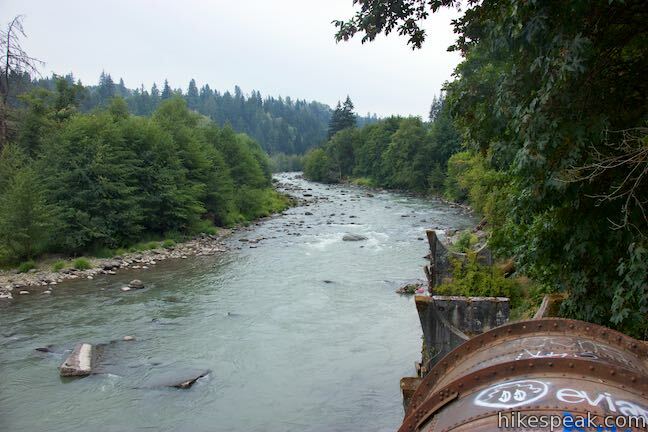 Ahead, the pipeline runs right up the center of a steel bridge. 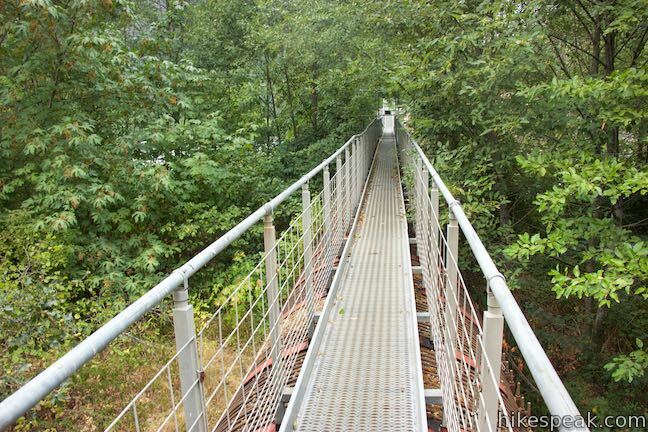 Since the catwalk is on top of the pipeline, it crosses over the top of the bridge. 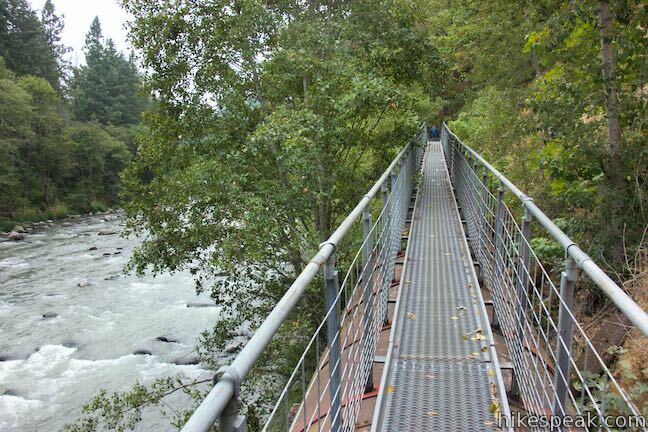 This route has commanding river views (and the catwalk has handrails on both sides for safety). 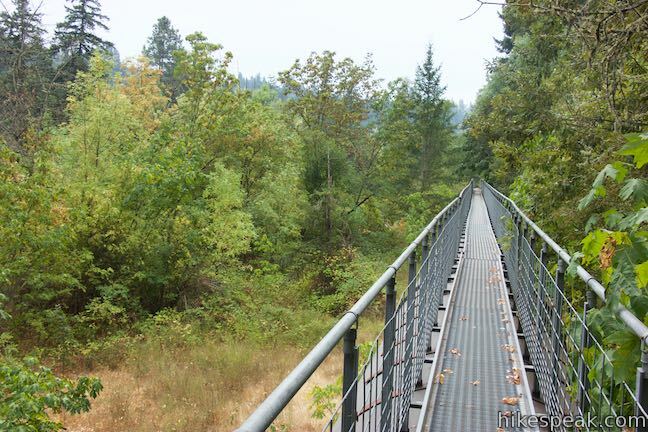 Take the catwalk across the bridge, enjoying perspectives up and down Hood River. 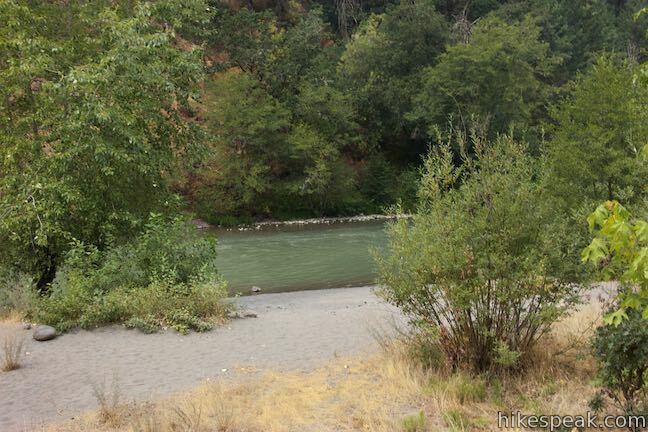 A pool just upriver from the bridge looks appealing for fishing and the riverbanks have plenty of picnic potential. 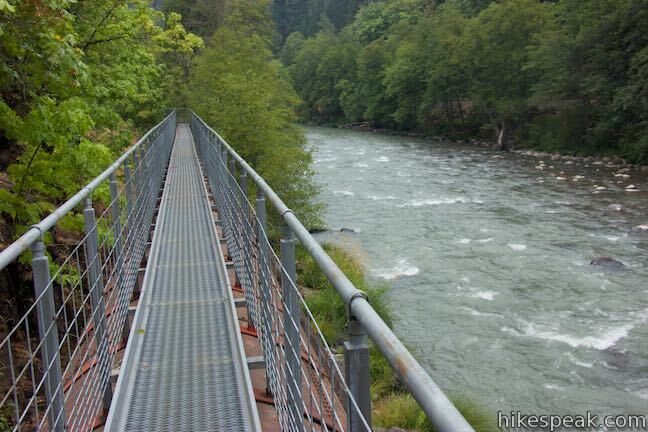 Having walked on dirt trail for the first 0.8 miles, the next 0.6 miles of the hike stay on the gangway. 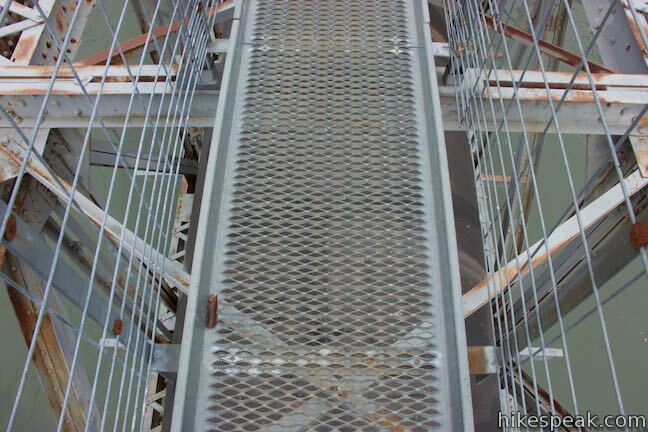 On the far side of the bridge, spot a service ladder on the right, which could be used to get down to river level. Pass through a gate and continue on the catwalk on top of the pipeline. 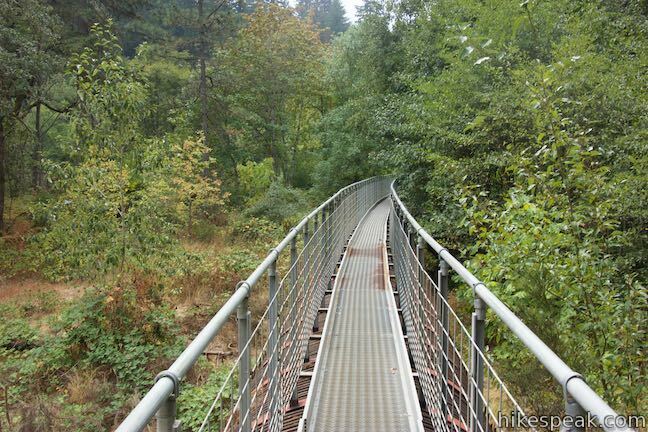 The catwalk puts you about a dozen feet above the ground, up into trees whose branches sometimes encroach on the trail. 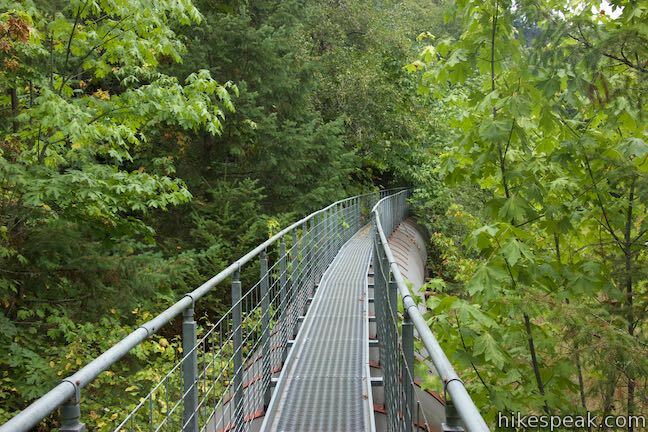 Feel what it is like to walk through the trees on this canopy-crossing catwalk! 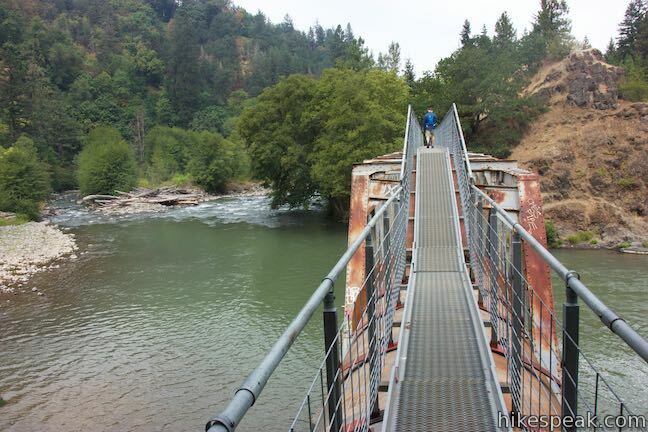 The catwalk was used to by PacifiCorp to service the pipeline between the Powerdale dam and substation. 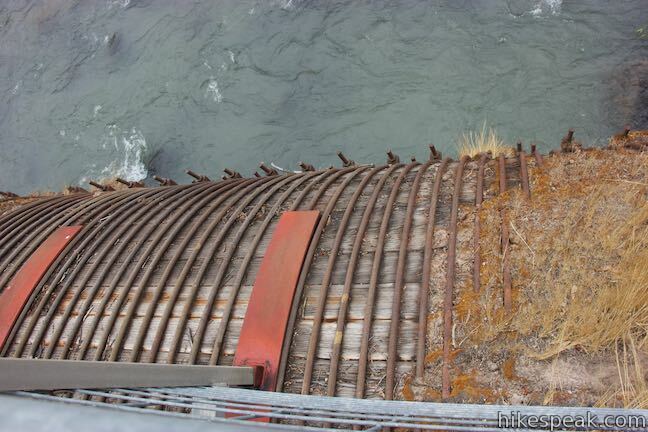 Look down on the pipeline as you go and notice that some sections are made of steel, while other sections of the penstock pipeline are assembled from wood staves and rusty bands. This construction dates back to the 1920s. A major flood in November of 2006 destroyed sections of the pipeline. Prior to that, the pipeline below the catwalk still had water flowing through it. In an area of the pipeline nicknamed the “rainbow garden” water sprayed out of leaks in the pipe in impressive bursts. 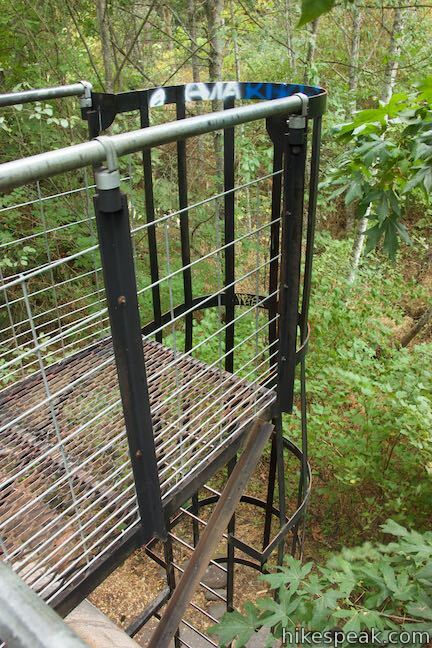 The pipeline no longer carries water, so there’s no chance of getting sprayed on the catwalk. 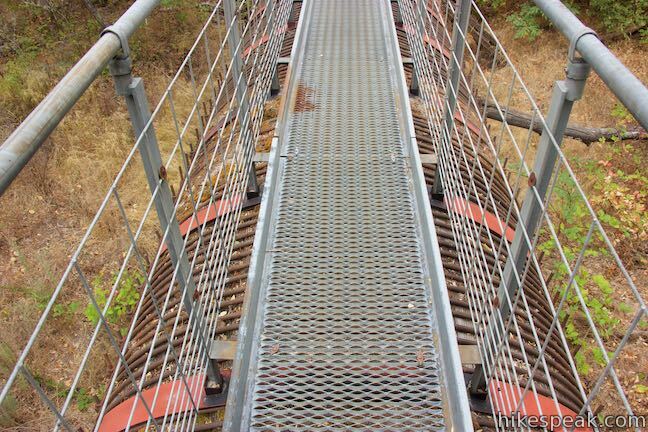 Handrails run all along the sides of the catwalk to keep you on course. 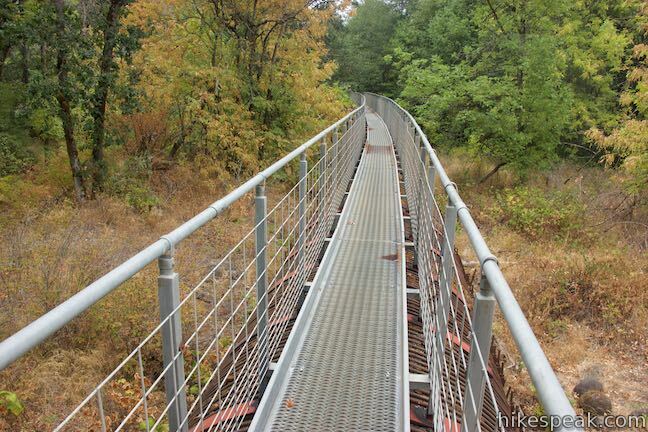 The handrails are in fine working order despite a few sections that appear to have been bent by fallen tree limbs. 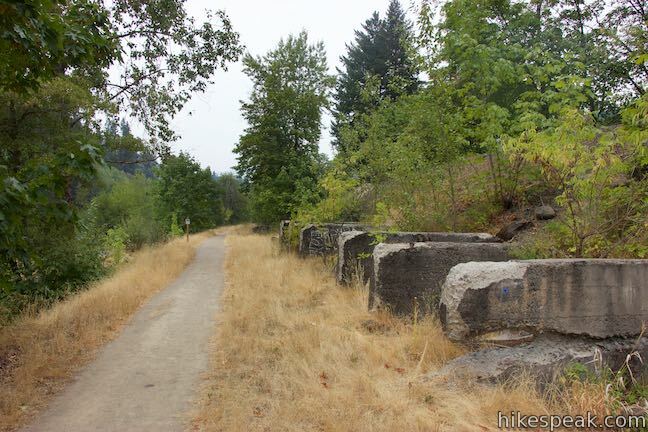 The walkway itself shows a few signs of disrepair, so pay some attention to your footing along this otherwise easy path. 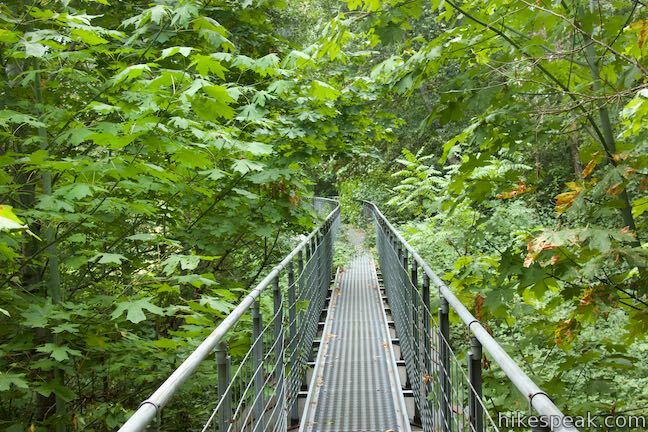 Proceed up the catwalk like a breeze through the forest. 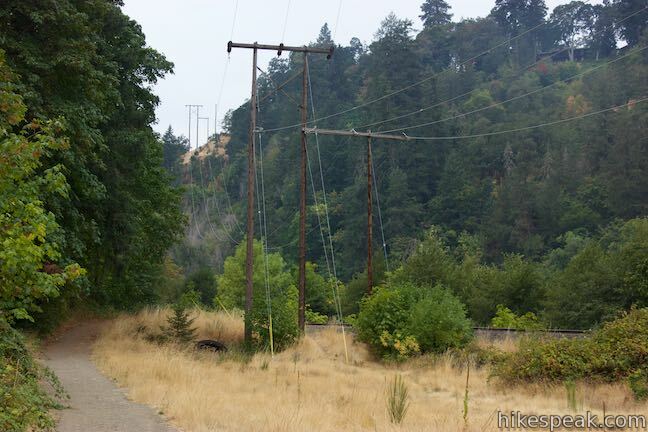 The steep bank of the canyon rises to the right and Hood River sweeps in and out of view to the left. 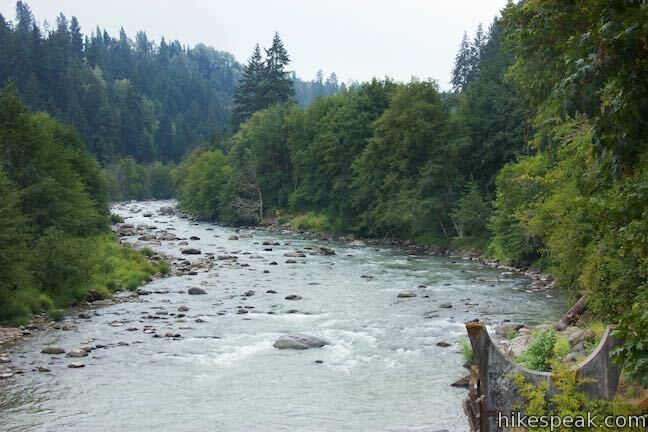 The pipeline runs along the shoreline for a stretch and the catwalk provides nice vantages across rapids in the river toward more forest. 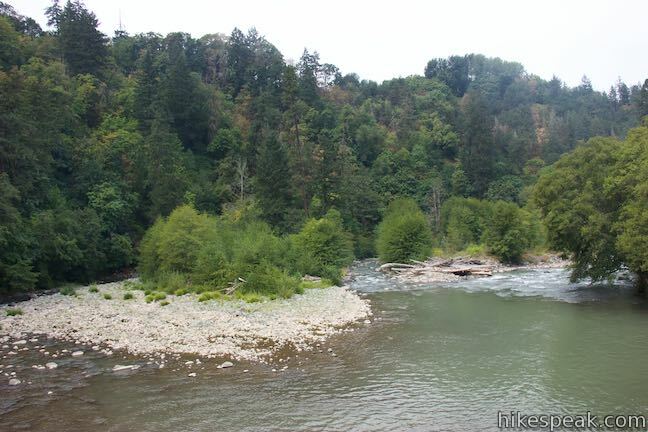 The railroad line is visible on the far bank. The mostly-level catwalk tackles one slope as the pipeline rises into more forest. 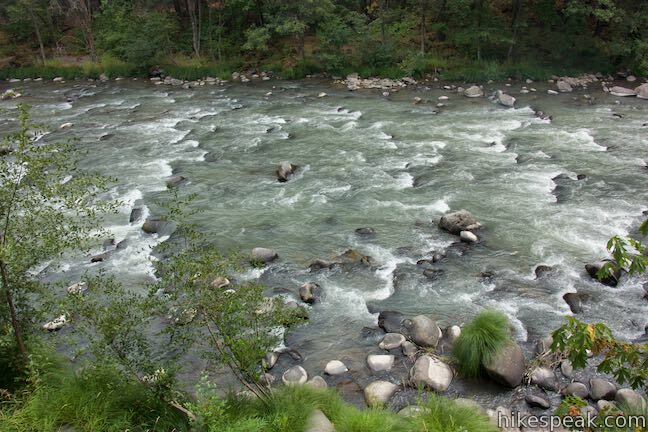 When the river comes into view again, the pipeline approaches a sweeping bend. 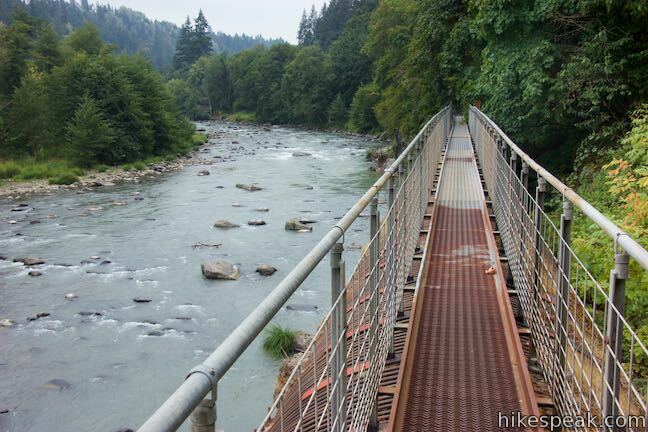 As you absorb the upriver views, the catwalk comes to an abrupt ending. 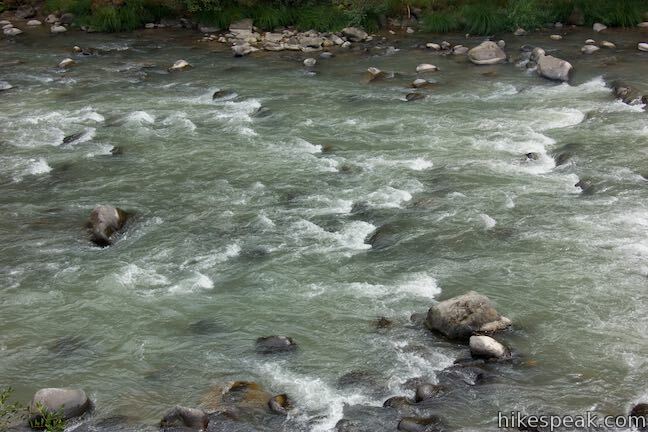 In front of you, the rest of the pipeline is suddenly missing, having been destroyed by the 2006 flood. Unfortunately, the fun ends here and it is not possible to go one step farther. 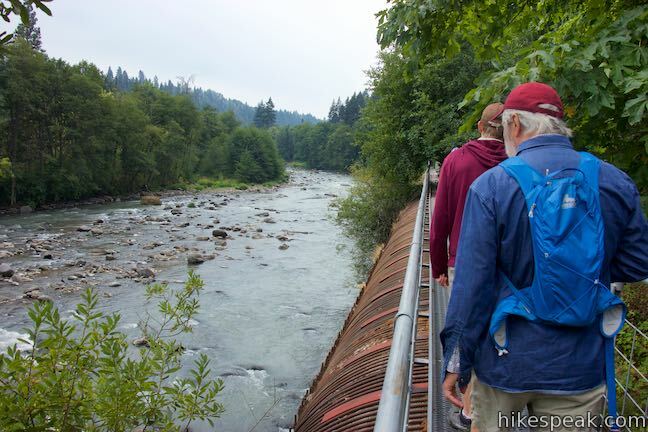 Some of the old supports for the pipeline are still visible beside the river, allowing you to imagine the route of the old flowline. 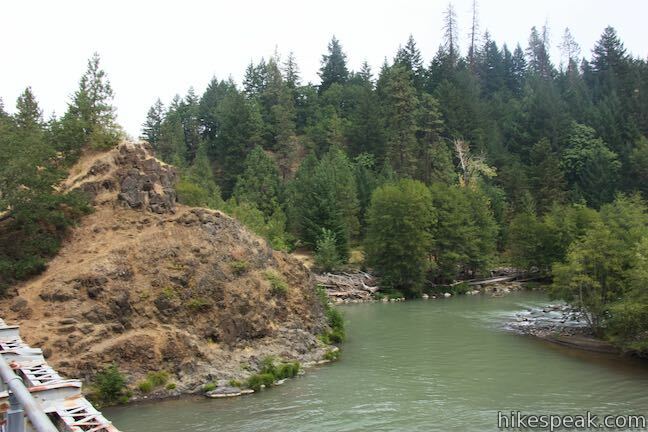 Take in this fine perspective of Hood River, before turning around and walking back down the pipeline. 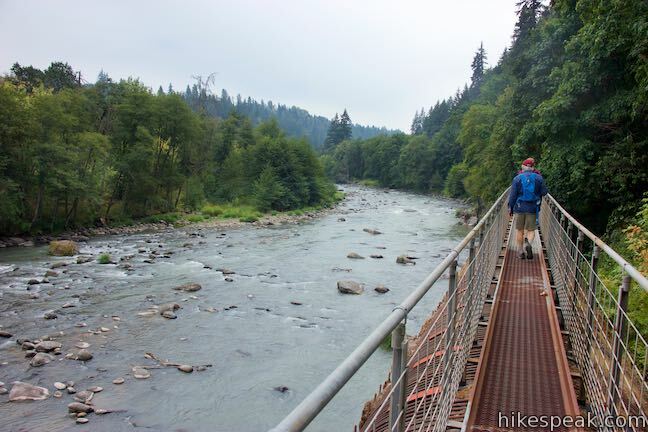 This hike is 2.8 miles round trip with 100 feet of elevation change. While the dirt trail for the opening 0.8 miles of the hike is not marked, it is easy to follow. 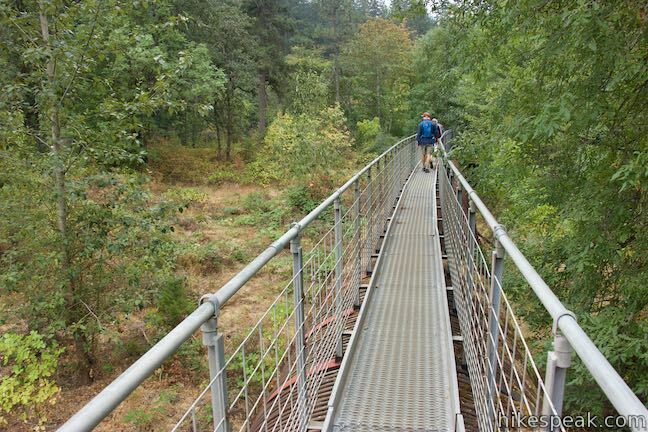 The 0.6 miles of catwalk trail are straight forward, with no junctions that could lead hikers astray. 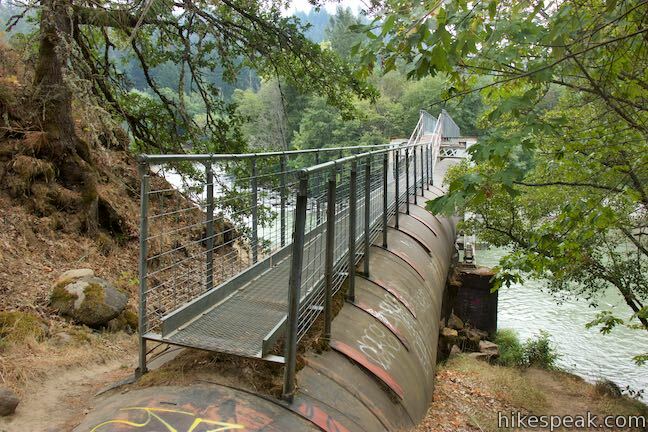 Hood River Penstock Flume Pipeline Trail is a memorable and enjoyable outing. 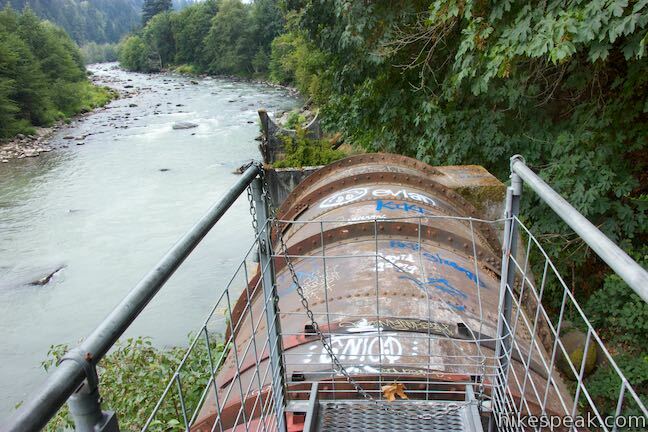 In addition to being unique – Where else can you walk on a catwalk on top of an old pipeline? 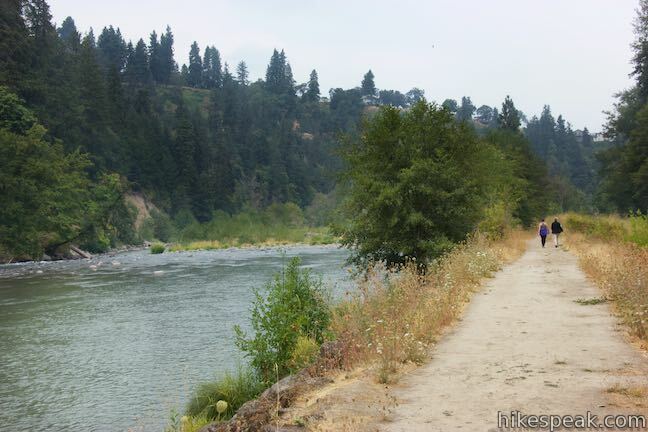 – the trail offers passage through a scenic stretch of Hood River that might otherwise be inaccessible. 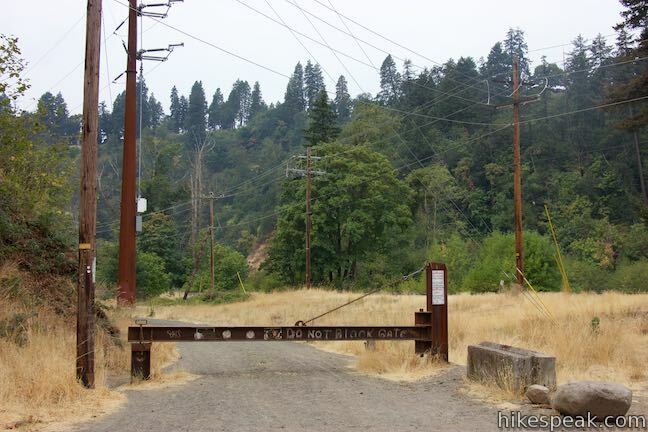 Other than a kiosk for the Powerdale Corridor Conservation Lands, the trailhead does not have any amenities (no bathrooms). Camping and overnight parking are prohibited. This trail is not appropriate for dogs or bikes. 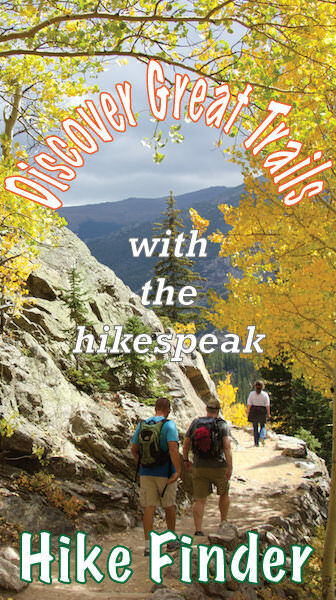 Parking at the trailhead is free and no permit is required for this hike, so get out and enjoy! 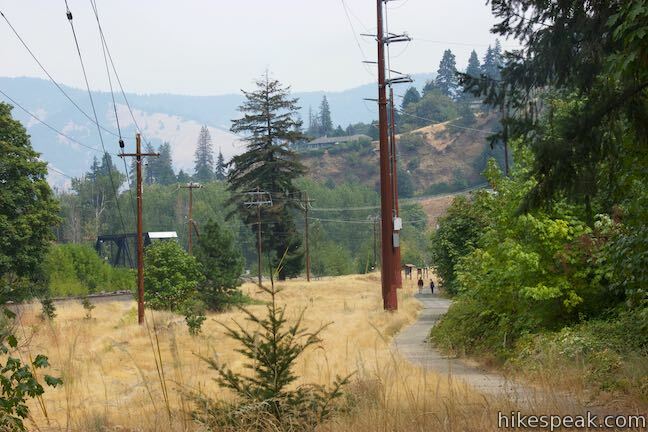 To get to the trailhead: Take Interstate 84 to downtown Hood River. Get off at exit 64, following signs for Oregon 35 (Mount Hood Highway). At the end of the offramp, turns south on Oregon 35 toward Government Camp and Mount Hood (do not go north toward Hood River Bridge and White Salmon). After 1/3 of a mile, go through an intersection with Route 30 and Old Columbia River Drive. Drive another 0.2 miles and make the next right down Powerdale Road, which is unmarked. Slip through the open gate at the top and drive 0.2 miles down this pitted paved road to a parking area at road’s end where the hike begins. 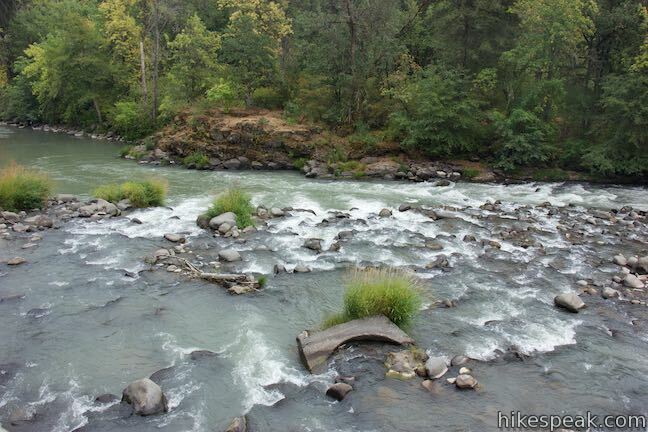 Or view a regional map of surrounding Oregon trails and campgrounds. These photos were taken in August of 2018. Click to enlarge. 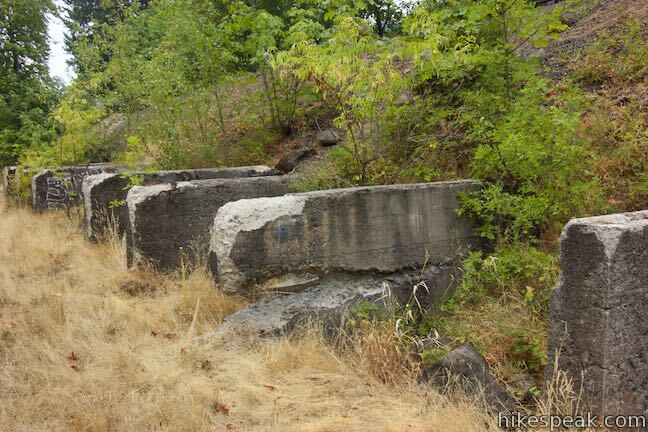 This 2 to 9.5-mile hike ventures up Historic Columbia River Highway State Trail to a pair of tunnels carved into basalt cliffs on the side of Columbia River Gorge. 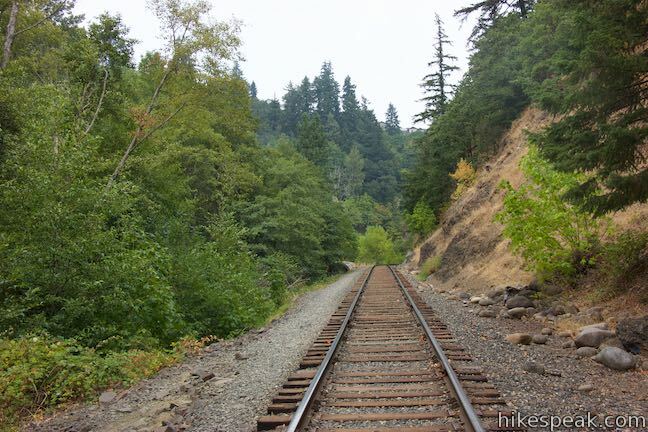 This partial loop covers 5.8 miles as it ascends Coyote Wall to great views of its basalt cliffs and across Columbia River Gorge. 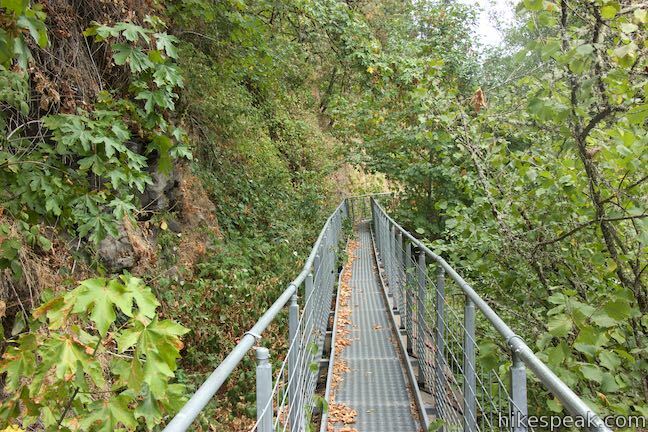 This 1-mile hike leads to the base of a curious natural arch in a basalt bluff. 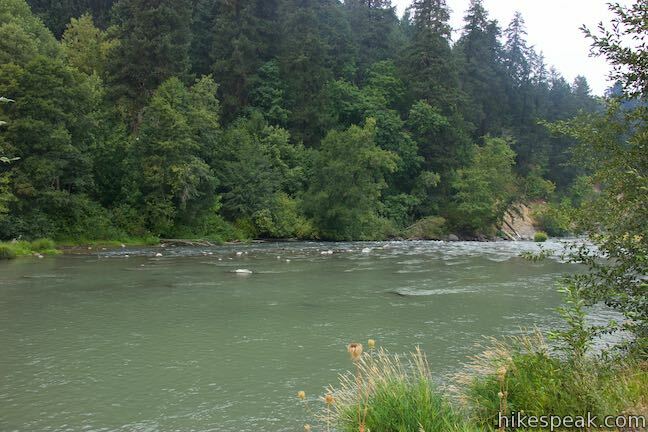 This short, paved loop explores meadows that burst with seasonal wildflowers, passing an overlook for a small waterfall and plentiful gorge views. 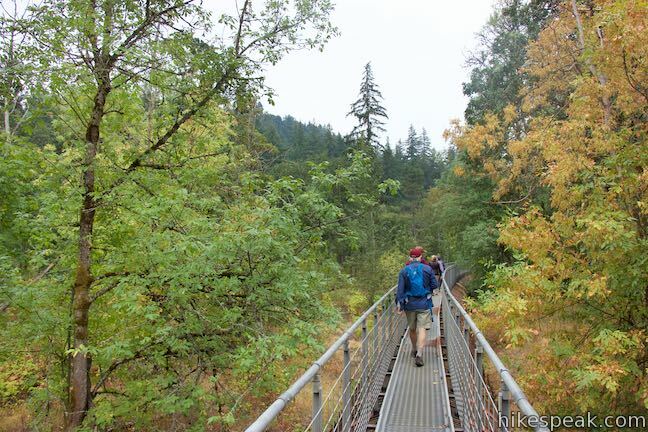 This 6 2/3 to 7.4-mile hike explores forests, wildflower-covered slopes, and grand views from a mountain along the Columbia River Gorge. 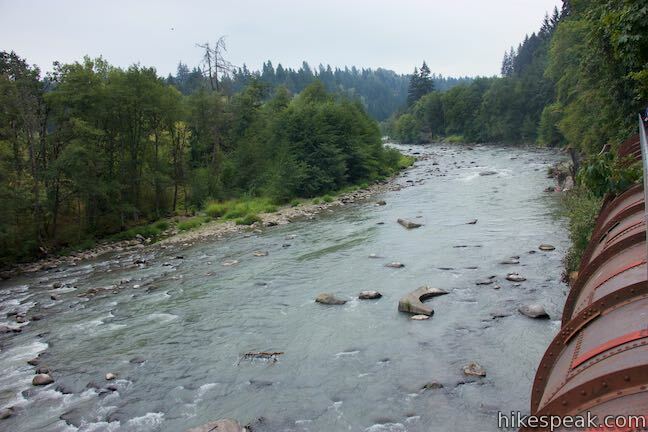 This 4.55-mile hike ventures up a beautiful and dramatic canyon to impressive waterfalls like Metlako Falls, Lower Punchbowl Falls, and Punchbowl Falls. 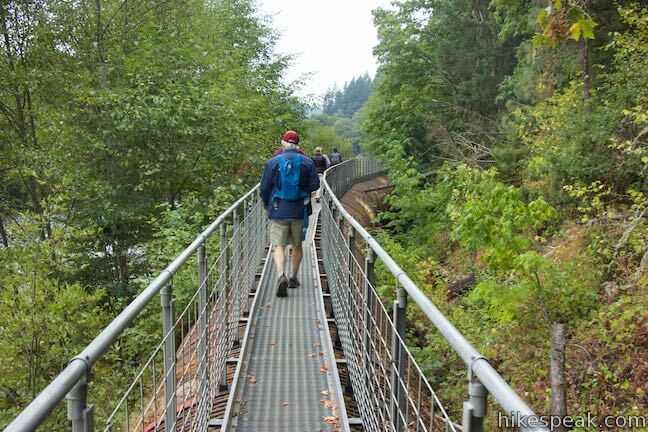 This 2-mile hike visits a sublime waterfall in a canyon within the Columbia River Gorge. 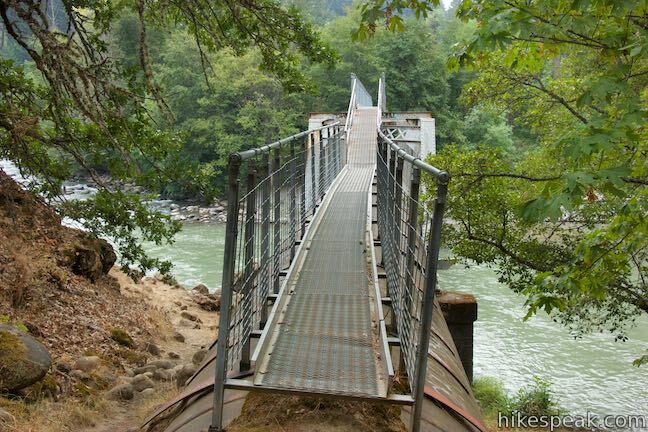 This 1.6-mile hike follows an impressively engineered trail packed with switchbacks that scale a monolith along the Columbia River. 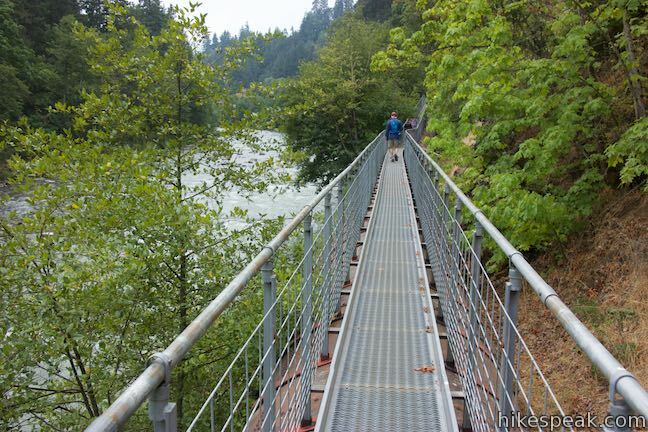 The beautiful 7.75-mile lollipop loop visits bombastic waterfalls and panoramic cliffs on the Washington side of the Columbia River Gorge in Beacon Rock State Park. 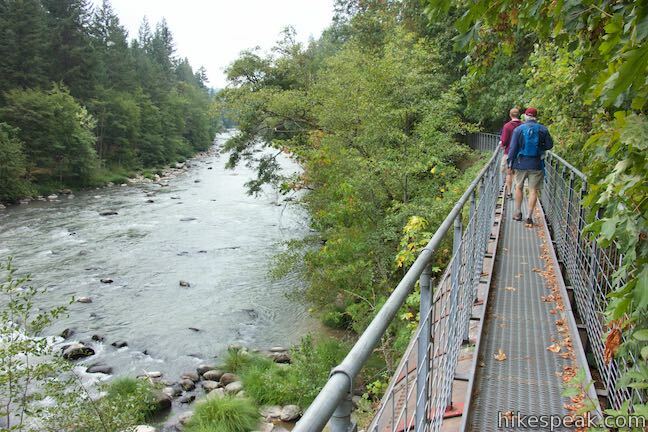 This 0.4 to 2.6-mile hike visits Oregon's tallest (and probably most visited) waterfall, offering something to hikers of all abilities. 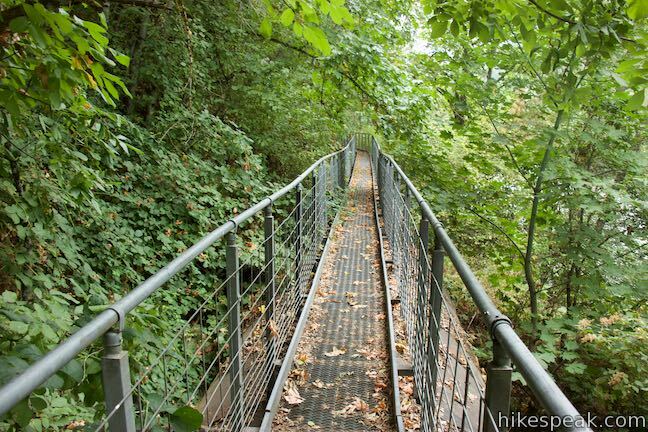 This 4.8-mile hike ascends to a panoramic landing with spectacular views across Columbia River Gorge (particularly at sunrise). 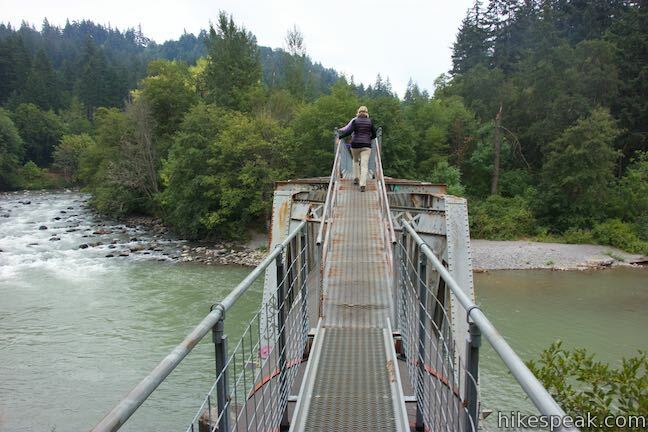 Explore other hikes in the Columbia River Gorge and different regions of Oregon.